Now in our 12th year of making fine wine vinegar, we have both followed and ridden the crest of the local foods movement. We appreciate that food grown locally is coming to be appreciated and consumed as it was several decades ago. My grandpa's vinegar jug in Leatherwood Vinegary. I grew up on a small central Minnesota farm. During the 1950s, 60s and 70s, Mom had a large garden and canned, pickled and froze so much of our food. I remember going with Dad to the “locker plant” to pick up meat that came from animals pastured on our land. Grass fed beef wasn’t a common term then. But it’s what cattle were. We didn’t use pesticides or herbicides until Dad’s farm classes (that all area farmers were encouraged to take to learn how to do it right) insisted he should use Round-up and commercial fertilizers though he always put natural fertilizers (manure) back on the land. One year Mom, who always subscribed to Rodale’s Organic Gardening Magazine, agreed that Round-up might take care of the weeds at the end of the garden. It certainly did. That area wouldn’t grow anything, for years. During my years on the farm, pickles were made with distilled white vinegar though apple cider vinegar made its appearance a few times. 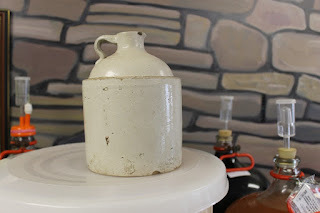 My grandfather had a vinegar jug (and I have it now) but I don’t think he ever attempted to make his own. It’s likely that when he went to the grocery store he filled his jug from a vat of some kind that the store made available to its customers. So, throughout the last century or more, people not only didn’t make their own vinegar, they lost the knowledge of how it was made. This is evident during the tours we host in the vinegary. Many times the looks on peoples’ faces reveal the wonder of the process during which bacteria converts alcohol to acetic acid—vinegar. A more recent trend, that of locavores who look for sources of all their food within a set distance from their homes, has evolved into entrepreneurs who are making artisan food products and are looking for local sources for the ingredients for their products. Several of these are either already using our vinegar or are considering it for use in the near future. Our most enduring example is Bon Appetit Management Company. They have been offering Leatherwood Vinegar in their catering and buffet services for several years. Minnesota’s History Center is a prime example as well as the catering they do for the University of Minnesota. Isabel Street Heat, produced in St. Paul, Minnesota, uses a salt crusted fermentation process to create their hot sauces. Interested in creating a healthy probiotic version, Tony and Leslie Stoy contacted us and have begun using Leatherwood Vinegar in some of their products. Last month, Will Flanagan of “ brine+barrel pickle company” contacted us about using our vinegars in the pickles made by this brand new Twin Cities company. While the nearly year-long process of making our vinegars makes the price somewhat prohibitive for pickle-making, Will and company are taking a careful look as to how they might produce a special entirely local pickle product. Just last week Molly and Maddy from the Twin Cities Stock Exchange stopped in for a tour and tasting. They went away with enough vinegar for a good start in enhancing their gourmet soup stocks with Leatherwood Vinegar. If you google “vinegar made in Minnesota,” the top two search results take you to information about our vinegary. Does that mean that there are no other vinegar makers in Minnesota? Maybe. At least made from scratch the way we do it. We’re listed in Minnesota Grown. It’s satisfying that Minnesota Grown has a list item of “vinegar.” They didn’t before we got involved. There are six listings under the “vinegar” heading. Two of them are farmer’s markets and only have vinegar if someone brings it to sell. Another listed business admits their vinegars are imported. One is a producer of apple products and though it’s under the listing, their website doesn’t mention vinegar. The last one hired Ron as a consultant to teach them to make vinegar. They’ve opted to send their fruit to a Wisconsin winery to convert it to wine and were quite interested in having a California company convert “their” wine to vinegar in a quick acetator process. Their website says they make their own though. It’s a wonderful trend that Minnesota products are becoming more complex and are trying hard to locally source the ingredients for their products. Read their labels. Ask questions. Support them!